Cut by code and duplicate edge cut keys, laser, dimple, cruciform, tubular and Tibbe style keys. One machine cuts all three keys by direct code, indirect code or duplication. Futura is one remarkable machine, equipped with ground breaking technology that offers multiple solutions for today’s key cutting requirements. 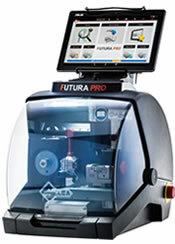 Futura is the most innovative, groundbreaking, and advanced electronic key cutting machine available today. Ultramodern in design and engineered to the highest quality standards; assuring you of accurate, precise cutting of a variety of key styles on one amazing machine. One machine can provide you with capabilities for edge cut, laser, dimple, cruciform, tubular, and Tibbe style keys. Standard cutters and jaws cover over 90% of edge cut and laser style keys on the market today. Optional accessories are available to expand with your market needs. The 009B is an economical solution for duplicating standard tubular keys. Simple to operate and provides accurate duplicates in just seconds. With the popularity of tubular security keys, the 009B key machine makes the perfect addition to your key cutting services. The 009B is simple to operate and features a unique key positioning device to assure quick, accurate gauging of the key blank. The Crown™ duplicates both standard and various specialized tubular keys. It is versatile, easy to operate and provides unrivaled accuracy and precision. Features of this machine include self-centering clamps that accommodate various diameter tubular keys and automatically synchronize the rotation of the key blank with original key. 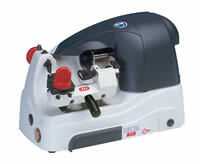 In addition, this model has micrometric vise positioning that is ideal for “step cut” or “cut within a cut” duplication. Cuts the angles of the Tibbe key by code. This 4-sided Tibbe style key is used on some Jaguar, Merkur and Ford vehicles. 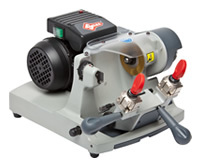 The machine is very simple to operate, easy to maintain, and provides superb cutting results.